Living in Macon, Ga., after a long residence in the “second city” for blues, Detroit . . . what small successes there were took place down South. Up North there was more regular work with low pay, but in the south he had a hit . . . now the work is slim. To the extent that he comes up to the Hudson Valley for a couple of months to get some fair-paying gigs. He is not Marshall Tucker, or James Montgomery, or Wet Willie, or even The Allman Brothers . . . he is not white carbon paper at all! Ironic that his former employer’s posthumous organization makes it all with such stuff. And ignores the real thing literally around the corner. There are some sessions done a couple of years ago after a job at a local college . . . often rough . . . engineering could be better, but the four-track was free. Here are two songs done at Capricorn, and sat on since ’69. Here are blues, both laid-back and driving; here are R’n’B things for dancing, some with a simple, repeating, building vamp structure. Here is soul, some quite autobiographical in nature. Eddie plays like only himself . . . no warmed-over B.B. King licks . . . even some slide (Duane wasn’t the premiere slide-man in Macon), Eddie sings himself into the mike, telling an intense story at all times. It is not always pretty, but it is real. Here is black music of the South today . . . here is truly funky music. 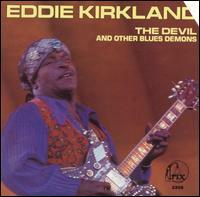 Here is Eddie Kirkland. In the nearly twenty years since the brief liner notes were written, Eddie Kirkland has been working the difficult life of a touring black musician, trying to keep a good band together, and present his art to the public. When I first met him around 1970, Eddie was almost totally out of the music business – his juke-box hit, “The Hawg” had pretty much played itself out as a factor in generating gigs. He was working sporadically as a car mechanic and dreamed of running a motel. I helped interfere with that dream. First came a series of long interviews that led to a few articles in small European blues magazines. Then came a series of solo recording sessions (some examples of which are collected on Trix 3301; “Front and Center”). By the spring of 1972, Eddie was up in the Hudson Valley where I taught at the time . . . I got him together with some local musicians under the leadership of Dan DelSanto (Trix 3314; “White Feathers in the Coop”) to work with a band. They played during the afternoon of the big spring concert at S.U.N.Y. – New Paltz (along with Baby Tate [Trix 3313] and Larry Johnson) to a great reception. 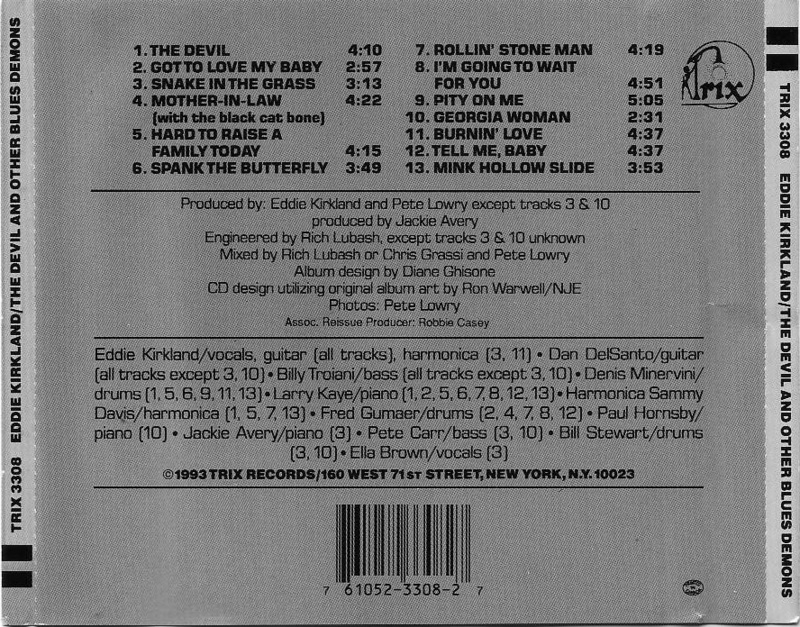 A couple of days later, Eddie and the “Italian-American Blues Band” (plus some added extras) went into a studio to cut material for this release. After that, Kirkland made the Hudson Valley his second, “summer” home, playing everything from bars to colleges, prisons to hospitals . . . anywhere his music could be heard. Any thought of leaving music was gone, even though the life was hard, full of tedious road time, broken-down equipment. and dishonest club-owners. But wherever Eddie played, the audiences (and most of the club-owners) loved him, his music and his explosive energy [akin to James Brown (who played drums on Eddie’s first King Records date in 1951 or so) or Tina Turner]. He brings the house down with ease! Eddie Kirkland never stays in one place, musically or otherwise. This album represents a chunk of where he was musically in 1972: a few of these tunes still remain in his regular, active repertoire. Kirkland is constantly writing new material, arranging it in an up-to-date fashion with his band of the time, and putting it over to the public in his own way. Now the man is busier than ever, even playing overseas – a few more albums have been released since this one, for labels like JSP [England], Pulsar [now out on Evidence] and most recently on Deluge. They all capture aspects of Eddie and his unique music. And “unique” is the key. One of the problems with Kirkland’s career is that he doesn’t easily fit into the pigeonholes that outsiders [like myself] like to create. Blues historian and writer Mike Rowe once stated that Eddie’s problem was that he wasn’t “blues” enough for the blues purists and was too much so for the soul freaks so that he could fall into the cracks between categories. Forget categories . 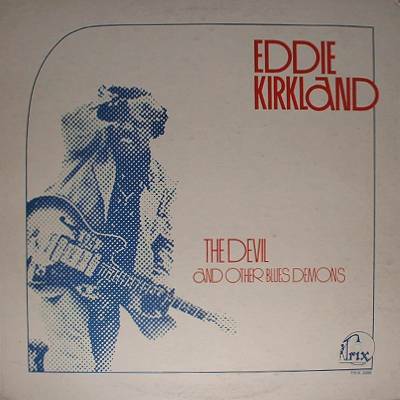 . . Eddie Kirkland and his music are beyond such things. Give a listen to his uniqueness either in performance or on this recording. And I dare you to sit still! Eleven of the sides on this album were recorded over two or three days at a four-track studio at the end of Mink Hollow Rd. in Lake Hill, NY (w. overdubs/”ping ponging”) in May 9/10 of 1972. Two additional sides were purchased from Capricorn Records in Macon, GA, who had recorded him in 1969. Mixing was done at Ray Hagerty’s studio in 1974 by Chris Grassi. For more on Eddie, see “Oddenda & Such”#49, #50, #51 and #68, as well as the liner notes to TRIX 3301. This entry was posted in Trix Notes. Bookmark the permalink.